What is the best way to visit the Vatican with kids? In this post, we share practical tips for a trip to the Vatican Museums with children and offer a review of the family friendly Vatican tour we tested. It has taken me over 6 years to tackle a visit to the Vatican with the kids. We go to Rome often, on average twice a year, and each time I make a point of bringing the children sightseeing: we have seen the forum, many churches, many neighbourhoods. However, the Vatican museums with kids in tow terrified me. Would the crowd be too intense for two little explorers? Would it be too boring for them? And would planning a visit to the Sistine chapel with kids be just silly? I mulled over these questions for a long time and, in the end, I made my mind up. 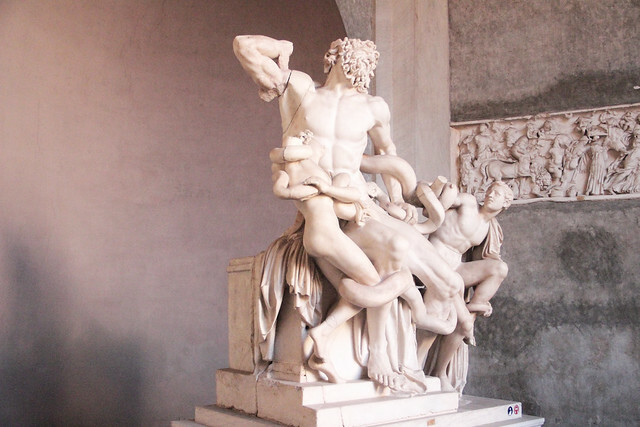 I would go to the Vatican museums with my little two, but I would enlist the help of a professional: the tried and tested guides of Rome 4 kids tours! Rome for kids tours is a provider of Rome tours for families that I know well. We recently took with them a pizza making class and a colosseum tour and, in both cases, we were impressed with the quality of their services and their attitude towards the kids. I knew that if there was anyone able to make a visit to the Vatican with children manageable, it would be them and our choice proved correct. GOING TO ROME WITH KIDS? MAKE SURE YOU ALSO CHECK OUR FAMILY GUIDE TO ROME AND OUR LIST OF RECOMMENDED HOTELS FOR FAMILIES! Rome 4 kids tours are excellent on many accounts. I highly recommend Rome 4 Kids for children tours in Rome and if you wish to visit the Vatican with children, look no further that Katja and her team! This is a video from our day with them (they took it, isn’t it lovely? ): keep reading for our full review! Conclusion: should you visit the Vatican museum with kids? We met our guides on a cold winter morning: the Rome blue sky had tricked us into believing it would be a mild day, but as we made our way to the museum we were grateful for the scarves and hats I had insisted on wearing. We had booked our tickets from 9.30 and to make sure we would make it on time we got to the Vatican by taxi. The car climbed slowly up the road and we immediately understood why our guide had insisted we would book tickets in advance and a specific time slot – the queue outside the museum was unbelievably long! A sea of people was forming a long snake of a line along the Vatican walls and the queue would go on and on until the eyes could see. Holding our pre-booked, skip-the-queue tickets for dear life, we went to get coffee and hot chocolate in the bar in front and when the time came, we met our guide just at the entrance. Tip n.1 for visiting the Vatican with kids: book your tickets in advance and select a specific time for the visit to get skip-the-queue access so you can get straight in. Katja, our guide for the day, is the founder of the Rome 4 kids tours and came out to guide us on this tour as a very special favour. We had the most amazing time with her and I cannot praise her enough as a guide: her experience is obvious in every little thing she says and does and she is so patient and able with the kids that she really managed to make the whole place accessible and enjoyable to all of us. On top of this, she is an incredible crowd-navigator and managed the full corridors like a super star! The first impact with the museum, on arrival, is overwhelming. The entrance is modern and clean but between the number of visitors and the need to pass under metal detector machines, the feeling is to be in the airport at peak time. The kids didn’t seem to mind but I was happy to have someone to follow and I didn’t have to navigate the bursting rooms by myself. Our first stop was the perfect antidote to the masses. Katja led us through one of the (many) courtyards to the carriage room and here we had time to breathe. The yard itself is beautiful and has a stunning view over St Peter’s dome, while the carriage room is the perfect way to get the kids interested in what the museum while giving them their ‘transport fix’. I had been to the Vatican before, but the view of the dome from the museum is so beautiful I had to stop and look twice to fully take it in. 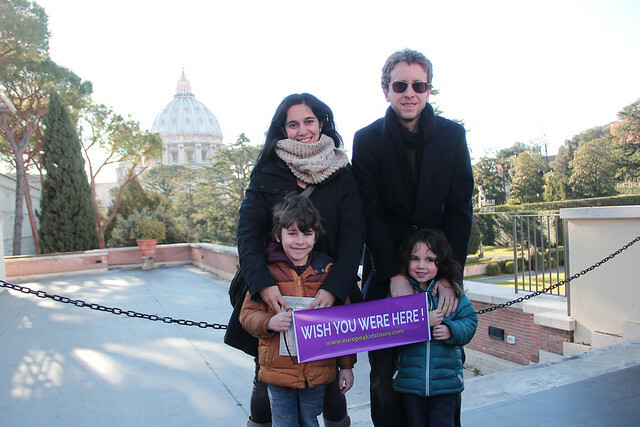 Booking a private tour of the Vatican with family friendly guides was the best decision: the kids stayed engaged all the time, enjoyed the day and even learned a lot – it was the perfect learning escape! The carriage room has means of transport of pretty much all shapes and sizes and shows how Popes and cardinals got around over the course of the centuries. The room has horse drawn carriages but also the several cars, including the very last one, equipped with a bullet proof protection put in place after the attack on Papa Wojtyla. After the first room, we made our way to the café. Little Ms E was under the weather (typical: we had two tours booked in Venice and Rome and one child was sick on each tour!) so a stop was needed, but this little break had a bigger purpose that just allowing her to rest. Katja came equipped with an iPad with kids apps that showed many of the details of the Sistine chapel and explained to the kids what to expect, what to look for and why the room was special. She took her time to explain about Michelangelo, how he painted the room while lying on his back and with paint dripping in his eyes (! ), she told the kids about Adam and Eve and how the whole story got depicted on the large roof, highlighting elements that were fun for kids such as the spiralling serpent. She told them the stories and showed them details they would never have the chance to see properly in the room and asked them to remember them to then point them to her once in the chapel itself, which, amazingly, they did! This was a very clever way of doing it as the Sistine chapel is otherwise difficult for a child to grasp in terms of difficulty of execution and artistic value. After this short break, the real scavenger hunt began. 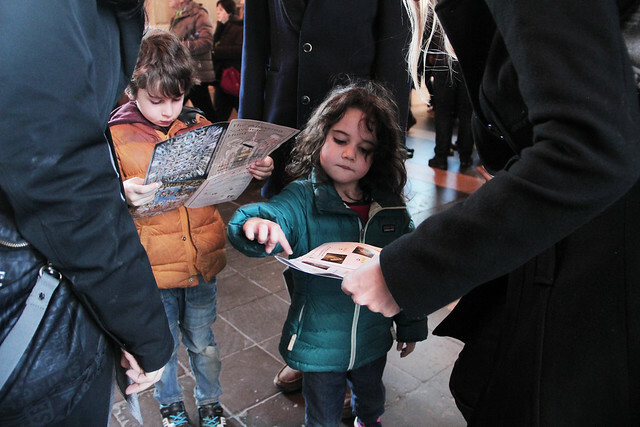 The kids received a booklet with pictures of statues and details to find in the museums and Katja gave them precise directions to make sure the crowds wouldn’t be too much in the way. The hunt brought us to some interesting rooms (the statue of the Laocoon is amazing, that was probably my favourite) and lead us all the way to the Sistine chapel. Mr M and Little Ms E studying their scavenger hunt booklet – they found everything and got a prize at the end! Visiting the Sistine chapel with kids is an interesting experience. The chapel itself is beautiful and mesmerising beyond words: the ceiling is incredibly elaborate and vibrant and the idea that a person was able to come up and actually create something like this is mind blowing. Sadly, the Sistine chapel’s beauty means that the number of visitors in it at any given time is also mind blowing and It is hard not to feel like a herd of cattle being shepherded into a pen. In the chapel, you need to respect silence and photos are not allowed and this is a good thing: visiting the Sistine chapel will give you a new understanding of what being a canned sardine must feel like, but the beauty of what you see compensate the stress of being surrounded by such a high number of people. If visiting the Sistine chapel with kids, my best advice (I should say, Katja’s best advice which I wholeheartedly agree with) is to head straight towards the partition wall towards the end of the room – there you have seats and a step and if you are lucky, as we were, you may find some compassionate tourists leaving you some space for little legs to get rest! The Sistine chapel was our last stop of the tour and, to quote Dante, ‘ we then came out to see the stars’. Or the sun, to be specific. We left the museums at about lunchtime, through a gateway open only go to tour guides (one more reason to book a tour with Rome 4 kids!). The sun was shining brightly by now and we were int her perfect position to enjoy St Peter’s square and then head for a meal. Katja’s professional experience meant we had a lovely morning and we were able to see one of the most interesting museums in the world and share it with our kids. 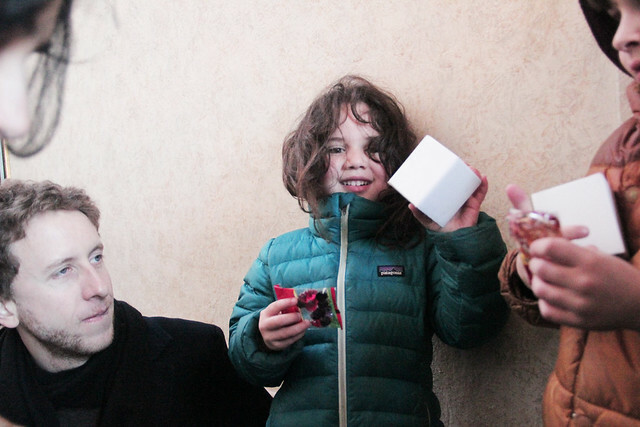 Happy hunters with their prize at the end of the Vatican tour! Book a tour with Rome 4 kids tours: they have the best materials and guides and make an otherwise very difficult visit a breeze! I have mentioned how busy the museums are over and over again in this post but overall my conclusion is: yes, you should visit the Vatican with kids, BUT you should do so with a private family tour! 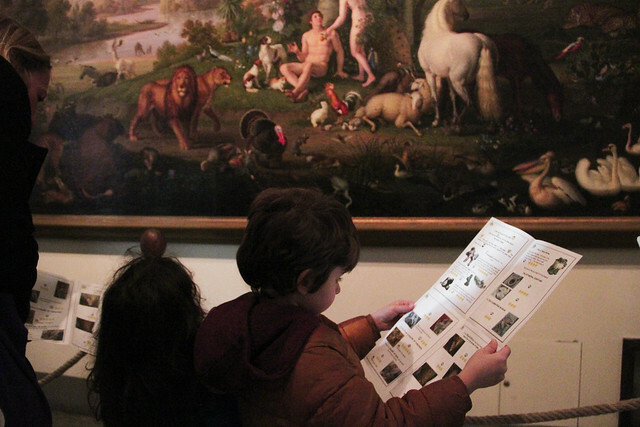 Most families with young children are likely to find the museums overwhelming and even frustrating if tackling them alone, but with the help of Rome 4 kids, the stress is taken away from you and both art lovers and kids can have a fun, interesting and educational day. This is why Rome 4 kids is one of our favourite providers for a learning escape.